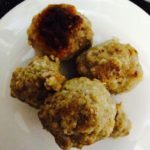 Delicious and addicting Italian Sausage Balls that melt in your mouth. A great appetizer! In a bowl, combine all ingredients and knead thoroughly. Shape into small balls and place onto cookie sheet. Approx 24.